You may already have seen this award winning documentary on television. 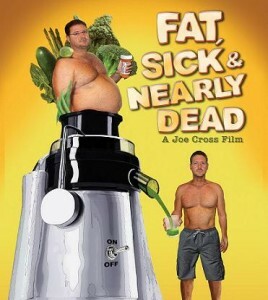 But if not, Fat, Sick and Nearly Dead is an uplifting movie about a man who decides to radically change his dietary and lifestyle choices in an effort to deal with his declining health and increasing waistline. Overweight, taking a daily cocktail of drugs and having been told that there was nothing more conventional medicine could do for him, Australian Joe Cross decided to tackle his problems in his own way. He chose to use nutrition, physical activity and his mental and emotional state to do what our bodies are programmed to do – and that’s to self-heal. Joe Cross decided that if he was going to tackle his demons, he should do it where his demons were the greatest. So he embarked on a life changing journey around the United States with a juicer, a generator and massive dose of commitment to reshape his life and his body. During his travels he met a trucker, Phil Staples, who was also overweight, on numerous medications, depressed and in dire need of ‘something’. The stories of these men, their journey and the people they influence around them is nothing short of inspirational. It’s testimony to the effects that diet and lifestyle can have on your physical and mental health. Both men, under the supervision of a doctor, underwent a 60 day juice fast. Without knowing the intricate details, it’s difficult to know exactly what went into the juices and whether they supplemented the fast at all, and it has to be remembered that these two people were fairly extreme cases hence the length of their fast. 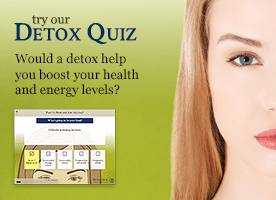 However, throughout their journey they encouraged others to use nutrients to rebalance their bodies – as long as they consulted their family doctor – for a shorter period of 6 days and the results spoke for themselves. Those who took part in the community juice fast organized by Phil, spoke of more energy, better sleep, improved concentration, increased general health and generally feeling “amazing”! We also see footage of Joe swimming and running; so there can be no denying that his greatly increased activity and improved psychological state were likely to have been major factors in his health transformation. When speaking about Joe’s 60 day fast he said: “ We certainly changed his lifestyle. We didn’t just change what went into his mouth. He became more active, stopped drinking, doesn’t drink tea and coffee, and he doesn’t buy manufactured, processed food. By the end of the movie we’re told that neither Joe nor Phil need to take any medication anymore – why would anybody living with any sort of ill-health not be desperate to give this a go?! “A huge number of people are looking for some kind of a cue or stimulus to change their diet or lifestyle. Joe’s involved travelling, exercising, developing new social linkages, maintaining an intensely positive attitude, restricting caloric intake, ditching processed foods — and juicing. “It’s impossible to say just how important the juicing was for Joe and Phil’s transformations, and we need to remember that many have achieved what Joe and Phil achieved without a juicer. The raison d’être for this film is undoubtedly a source of inspiration. More information on Fat, Sick and Nearly Dead website. You can also find the official trailer here. A longer version of this review first appeared on the Alliance for Natural Health Europe website. We are grateful for their permission to reprint it in edited form here.